A couple of days ago I received an email from the U.S. Department of State. They have a website for sharing our country's story with other countries at http://www.America.gov. Under the American Life category is an area on Diversity where they explore the "look" of diversity in the U.S. 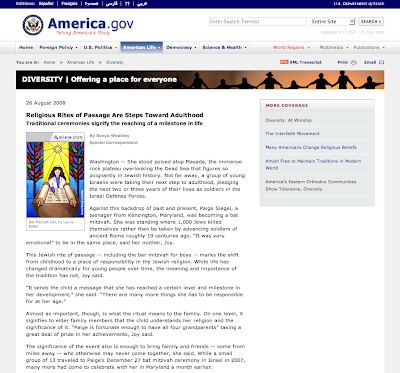 Yesterday they began running a feature on religious rites of passage, and asked permission to use my "Bat Mitzvah Girl" painting to illustrate the article. 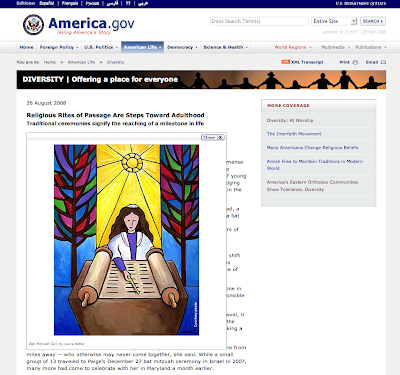 I am so honored they chose to use my art to represent Jewish Americans to the rest of the world. And, as I was about to publish this post, I got an email from them that they'd even pay me for the usage. Icing on the cake!